Greeks will wake up today to a mixture of excitement and apprehension as they vote in a pivotal plebiscite on their future in the European Union and the eurozone. But they head to the polls with the knowledge that their country is on the verge of economic collapse. 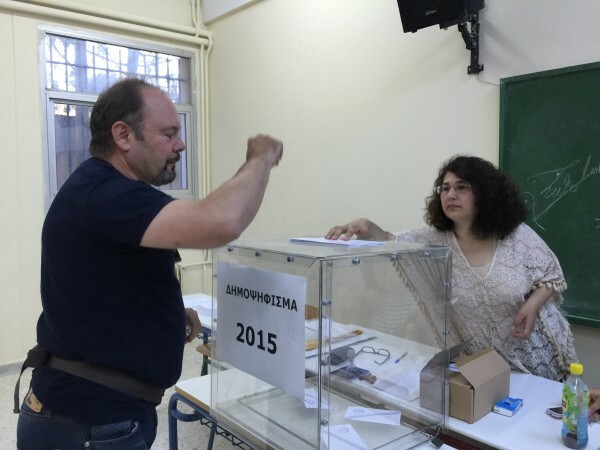 The latest Greek polls appear to show the country almost evenly divided. Whether they vote ‘no’ or ‘yes’ to the latest European bailout offer – albeit with a slightly less severe austerity regimen – the impact of Sunday’s referendum will reverberate throughout the continent for some time. If Greece votes no, there is a good chance that it could be forced out of the eurozone. Greece’s Finance Minister Yanis Varoufakis late on Saturday said the EU does not have the legal standing to kick Athens out of the eurozone. He accused European creditors of terrorizing Greeks because they did not extend additional monies to allow Athens to pay the IMF and thereby created an atmosphere of fear. Banks have been closed since Monday to avoid a rush to withdraw capital. Varoufakis told the media that banks will reopen on Tuesday irrespective of the referendum result. European – and by extension global – markets have flip-flopped in the past few months on the possibility of Greece’s exit. The IMF says the eurozone can weather a “Grexit”. Its head Christine Lagarde has said the bloc is strong enough to survive such a dramatic exit – a position held by some European finance ministers. She has also said that she will not consider negotiating with Athens until the results of the referendum are announced. On Saturday, German Finance Minister Wolfgang Schaeuble appeared to air a softer tone – if not third option – by suggesting that a “Grexit” could be temporary until Greece fixes its economy. “Greece is a member of the euro zone. There’s no doubt about that,” he told German media. “Whether with the euro or temporarily without it: only the Greeks can answer this question. And it is clear that we will not leave the people in the lurch,” he told the daily Bild-Zeitung. Could Greece return to its traditional drachma currency during this period? That is a matter of speculation at this point. Sunday’s referendum, which comes five days after Greece defaulted on a $1.76 billion loan payment to the International Monetary Fund (IMF), is the culmination of more than five months of often angry and fractious talks between the leftist anti-austerity Athens government and its money lenders in Brussels. For five months both Greece and the European creditors appeared unwilling to budge: Athens says the austerity measures implemented before the leftist Syriza party won national elections in January are too harsh and punish ordinary Greeks. They want the debt repayments restructured and Greek Prime Minister Alexis Tsipras has vowed to resign if Greeks vote ‘yes’ on Sunday. This position has earned the party huge support. The IMF and the European Central Bank, however, say Greece must live up to its debt repayments and can only do that if it reforms its economy by further cutting welfare spending and pensions, while simultaneously increasing taxes. According to Open Europe, an independent think tank, Greece owes the EU over $350 billion. Its budget deficit began to surge shortly after the government financed the 2004 Athens Olympics. But at least 75 per cent of Greeks want to remain in the eurozone, most polls agree. How they will do that after Sunday remains to be seen. The European Union, IMF and the European Central Bank and the dark forces behind them are to blame.Also the former Greek criminal governments are to blame. The EU, IMF and ECB are to blame for difficulties not only in Greece but also in other European countries. And the biggest terrorist in the world is the USA government and their secret cabal forces.